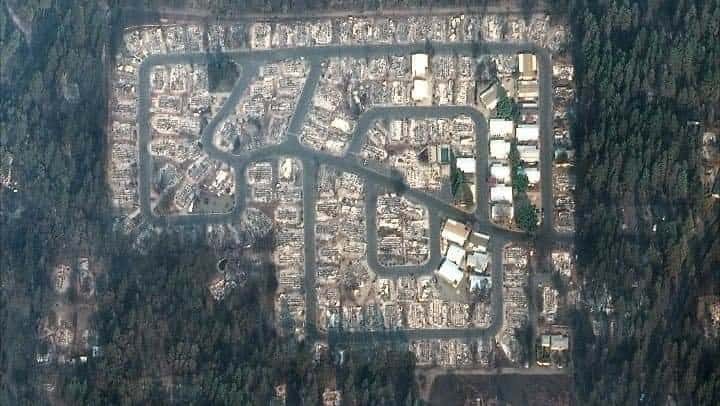 The evidence is overwhelming that the Paradise fire was a DEW / Smart Meter event, but directly preceding the fire, satellite images show a massive explosion that appears to have come out of the ground. 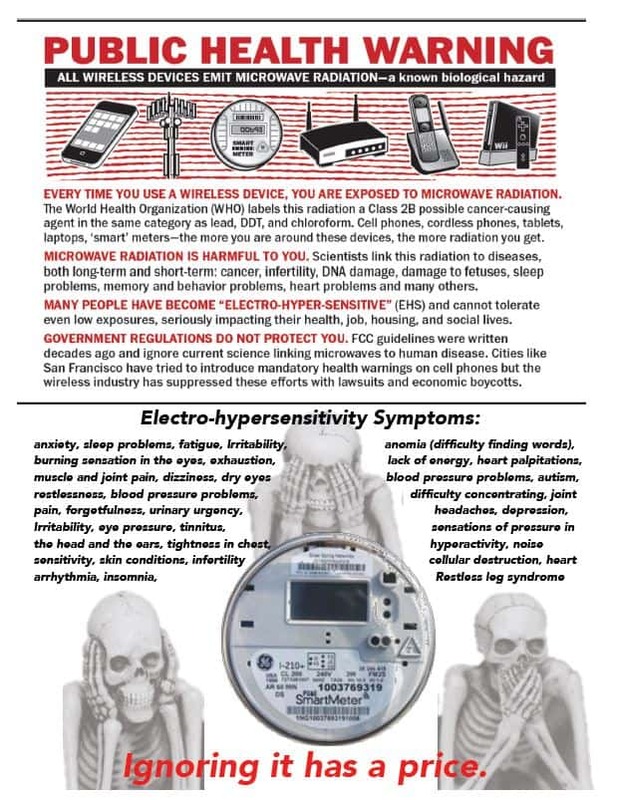 Researcher/author Craig Patin (article below) believes that DEW and Smart Meters were used after that triggering event. “There are testimonies from residents that there were loud popping noises and sudden booms that weren’t like explosions. This is reminiscent of both of those (DEW/SM) being used. 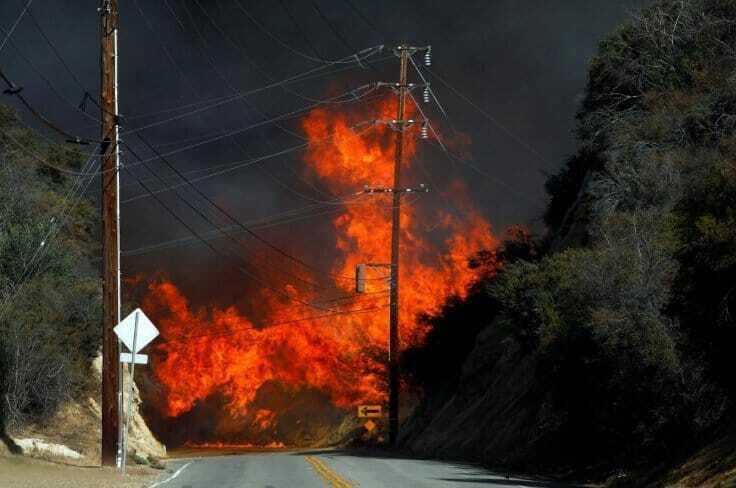 But what started the fire was something blowing out of the ground, not just an arc from a power line,” he said. Craig believes that that “something” may have been spiritually invoked. While there is no evidence to definitively establish this, Craig’s blog, HiddenInTheCrag.com, offers insight into the many coded headlines and public rituals we’re witnessing today. These are things that, as Christians, we should all be aware of. 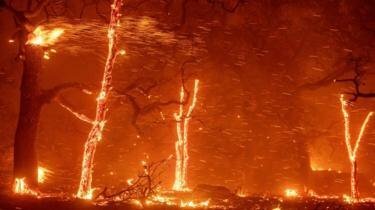 “People claimed even the fires were smart and literally chasing people. 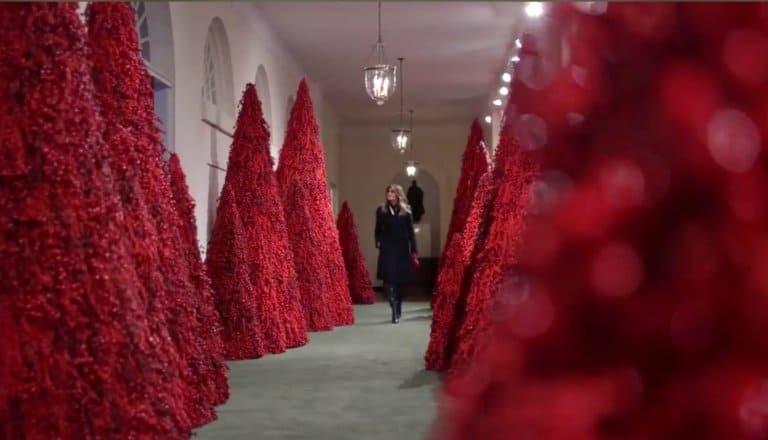 They were calling them “demon embers,” he said. The truth about DEW and Smart Meters is being disclosed to the public. Even those who have not wanted to entertain “conspiracy theories” in the past are listening now. But with secret societies and their social engineering, the truth always lies in deeper layers than what they allow to be revealed. Those layers are unending and unfathomably evil. Chaos Magick, “Christian Gnosticism,” the supernatural has been obscured from even the Christian public’s view, while occultists know exactly how real it is. It is where they operate. 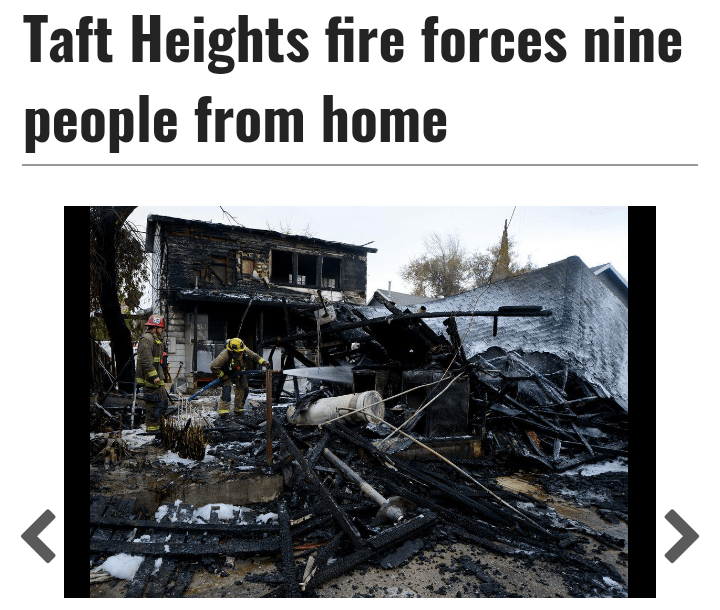 I started to look at some articles from the paradise fire the last few days and see if the information was still lining up. Obviously in these types of stories everything changes on a daily basis. With that said, the stories have changed now. 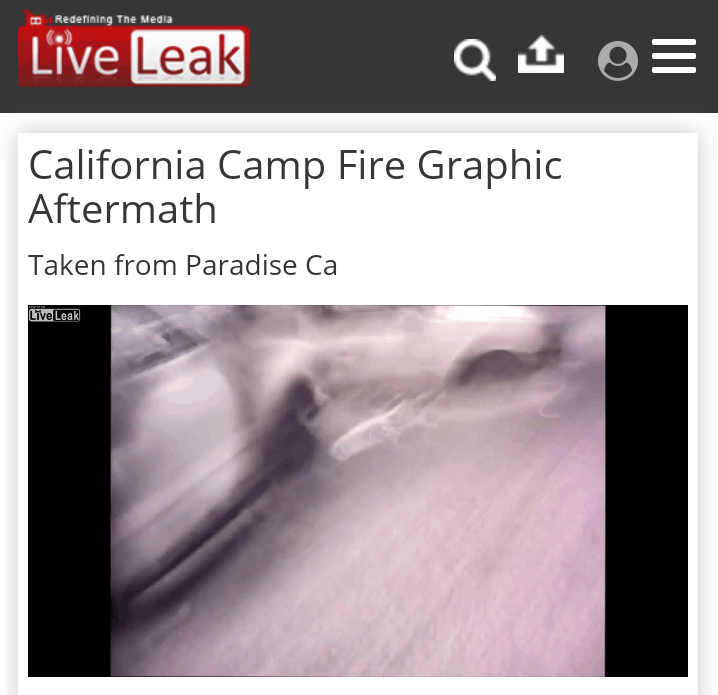 The original story is that this fire started above Paradise at a place called Campfire and this is why they actually called it the campfire. It was not associated with somebody having a campfire and a fire starting. 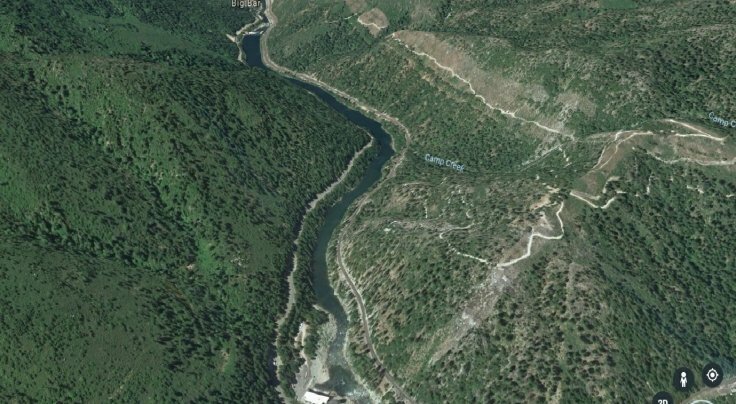 The original report I read said the fire started at a junction where Campfire Creek, Feather Creek and I-70 are. 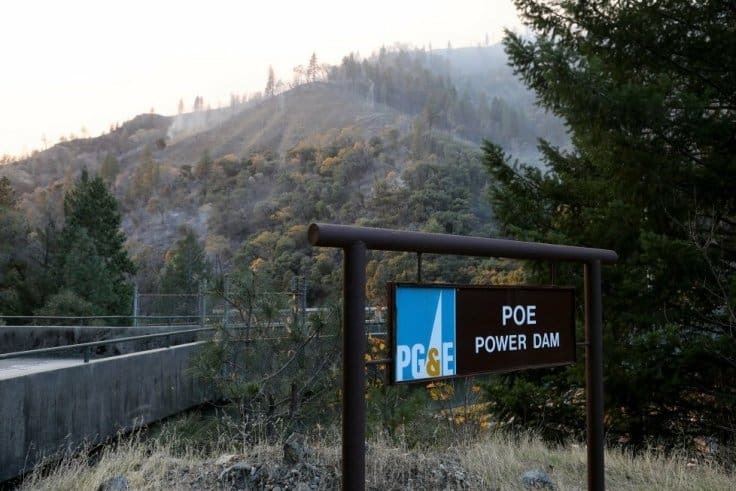 Now I’m starting to read a story from a fire captain from the forestry service name McKenzie, that this fire actually started at PG&E’s Poe Dam station from a power line on the other side of Feather River on the rocky side of the mountain from a tiny brush fire. Jarbo Gap is around 6 miles South from where everything took place as you can see the fire trucks in the picture below. 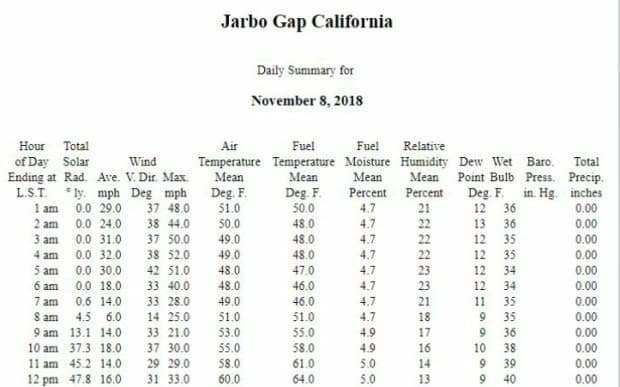 The article states that the Jarbo winds had everything to do with it in the canyon and they said the winds were 55 mph at the time. Jarbo in Arabic means strong, so it was strong winds, etymologically speaking. I’ll get back to this strong wind spirit vortex when I talk about Betsy, the face of Pulag. They claimed the fire started there and then spread out and first went to Pulag, then to Concow, then over to Maglia, then headed to Paradise. They said it was from a power line arching and causing the fire. Evidently Betsey Ann Cowley (reminded me of Crowley for some reason) had complained about these power lines because it just so happened to be on her property. I’ll get back to her in a minute. So, this was now the story they were sticking to. 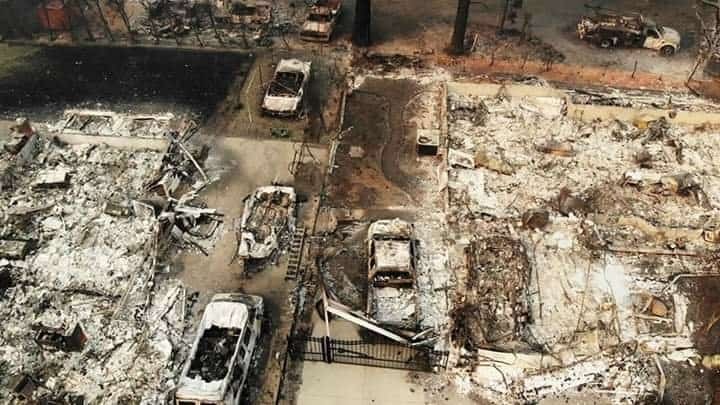 To me personally, I don’t see how a ground fire can cause this sort of damage in such little time and incinerate not only houses, but people and animals. 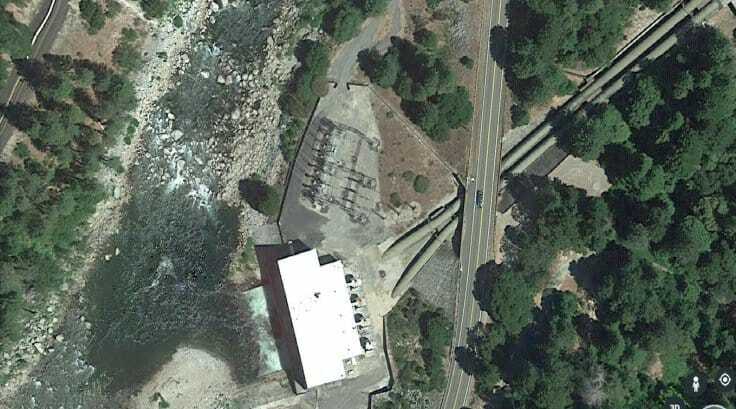 I traced the power lines on Google Earth and these lines from the hydro station 2 miles above Poe Dam lead South alongside the river sweep underneath Paradise to the West and then back North to Chico, which feeds Paradise and the outlying communities. I believe this fire was threefold. It was started by a DEW laser at the hydro station 2 miles North of the Poe Dam, that surged power near the Poe Dam that started the grass fire. 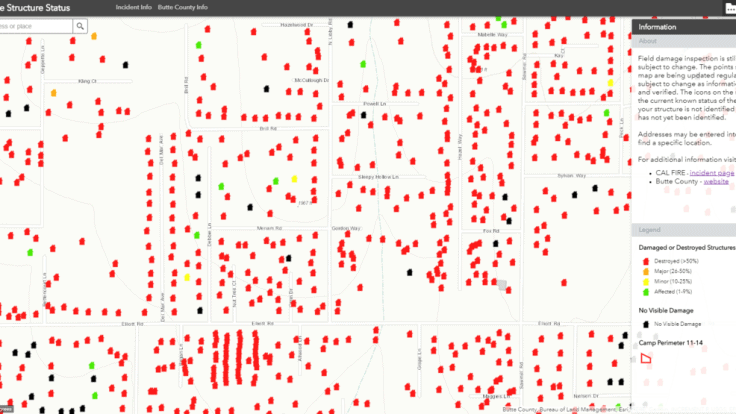 Chico is where countless meters have exploded on houses due to downed line surges. This isn’t a secret. So I find it strange that Chico’s problems could now be Paradise’s problem. 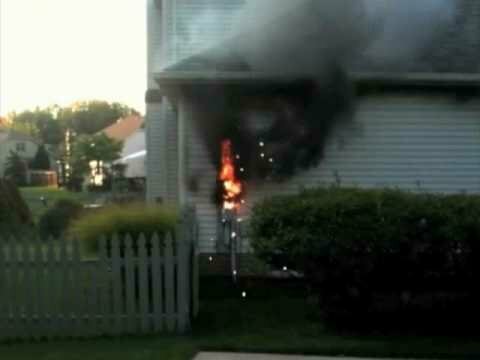 This connection affirms my belief that Smart Meters are what incinerated these houses and buildings in part with the actual ground fire itself. 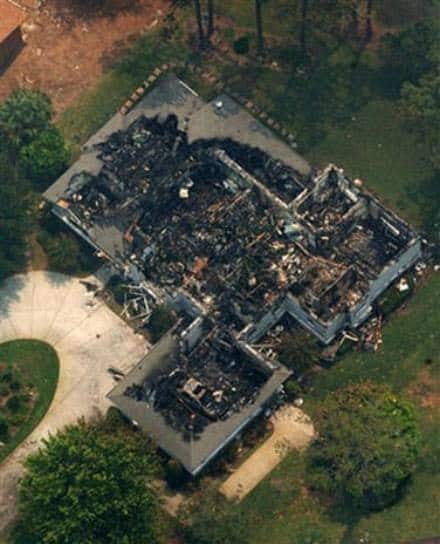 I believe the Smart Meters in conjunction with the lasers is why everything in incinerated to greyish white ashes and bodies were literally cremated in some cases. There is nothing blackened there like you would see with a ground fire. I first want to bring up a testimony from a woman named Cheryl Kirby who was from Paradise. I don’t know this woman from Adam, but I’m just giving you her testimony of what transpired up to November 8th. She claims 4 weeks prior to the fire, a strong wind came in that blew for around 7 minutes. It left a residue on her windows that was like a snowy white substance. 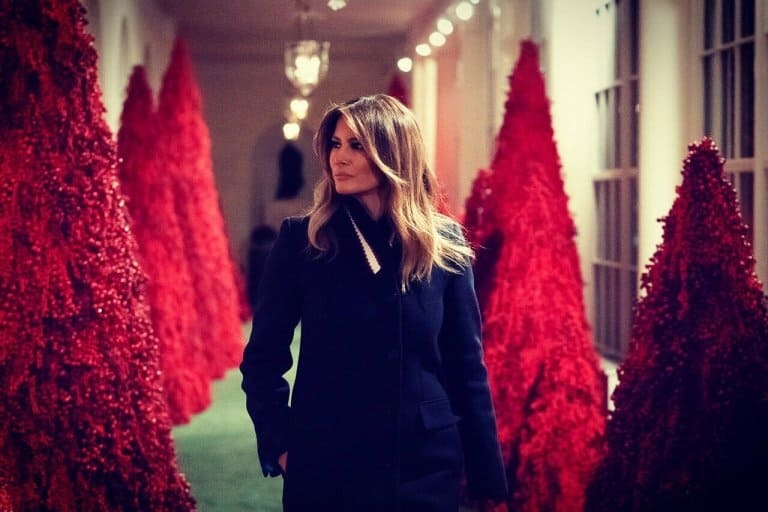 She claimed it was Morgellons. She believes it could’ve been used as an accelerant for the fires. Two weeks later she and other Paradise residents saw a private helicopter circling Paradise for an undisclosed amount of time. They thought that it was odd, to say the least, but thought nothing of it at the time. After the fact, they now believe the suits inside it were associated to some sort of land grab for Paradise. 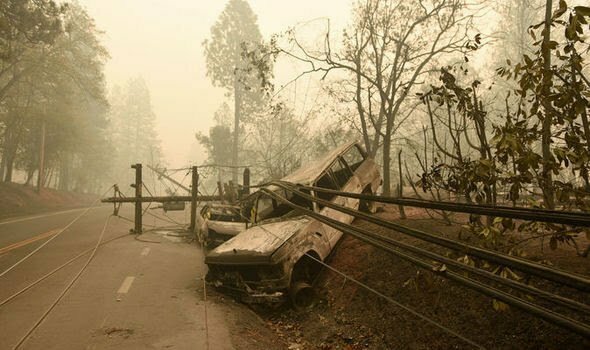 On Monday the 5th, Kirby and other residents started to receive emails from PG&E stating that there would be a planned power outage during that week due to fire dangers. 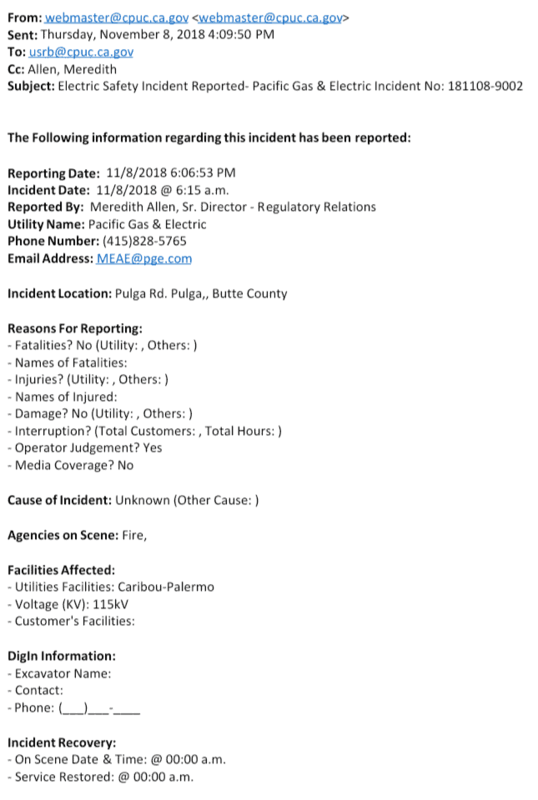 Either on that same evening, or Tuesday the 6th, they started to receive calls from PG&E (I’m assuming automated) claiming that there was a fire warning for a fire on Thursday, November 8th. They claim they got more than one call stating this. 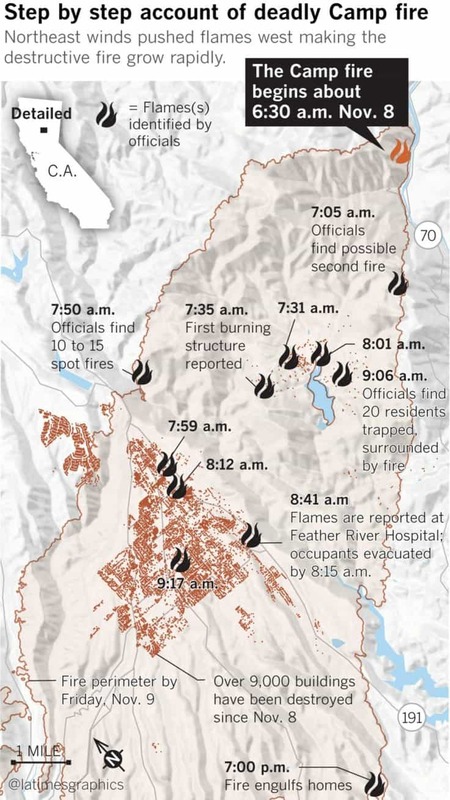 On the day (8th) of the fire, Kirby said she went out to get gas at around 7am and noticed smoke to the North of her that she thought was Maglia. She confirmed from other residents that it was 45 minutes away at Concow. Concow was near Pulga, where the fire had originally started. She said she went home to spray her property and house with water and started noticing embers coming in from a strong wind. She also said that a black tar substance was in the air falling to the ground. Now to me, this is interesting. What was the black tar like substance? She says by 11am she was evacuating Paradise, and as she was, she noticed that all of the power poles going down their main street, Skyway, were on fire. It wasn’t the entire pole but it was the boxes where internet, cable and phone was located. 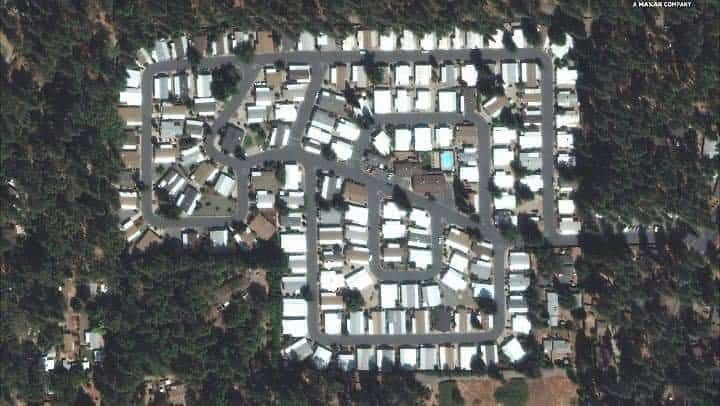 This is more than likely where the 5G was housed. Now the last thing she mentions about the boxes being on fire, confirms that they surged the electricity into the homes through the Smart Meters. Being that the boxes were on fire on the poles and nothing else was, is confirmation for me. 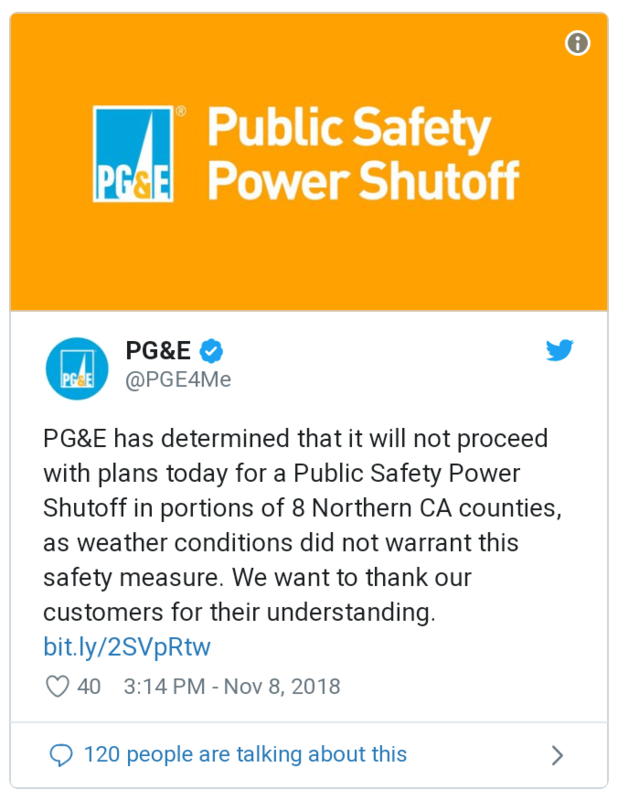 Now what is interesting is all the emails and calls of “warning” from PG&E. You know the elites like to forewarn us of events, because first off, they can clear their conscious and secondly, well they have to. Jesus brings that darkness to the light, so to speak, and nothing happens until it is told to the prophets first. I’m not calling these residents of Paradise prophets, but I think you get my point. I did confirm everything this lady said through separate sources and a “New Age” site summed up what this woman said that sounds identical to what I just wrote (I found the site after the fact: http://www.starshipearththebigpicture.com/2018/11/17/california-residents-trapped-and-killed-when-fires-were-started-all-around-the-towns-perimeter-videos/?fbclid=IwAR2wUgNXTOj4dp7jkEL1uGaCiz5Rh9L2GiHOrXEQvjnHJBBs8lIzyUL-pYo). I also know from a first hand account from my mom’s friend in Paradise, that she was personally told over Summer to be ready to leave her house due to a bad fire in the near future. Evidently they had told residents to have bags ready if they needed to leave their houses due to a fire. They were forewarning these people of Paradise and like the lady mentioned above, they were told about the fire the week of. I actually did come across PG&E letters to residents of these fire warnings. 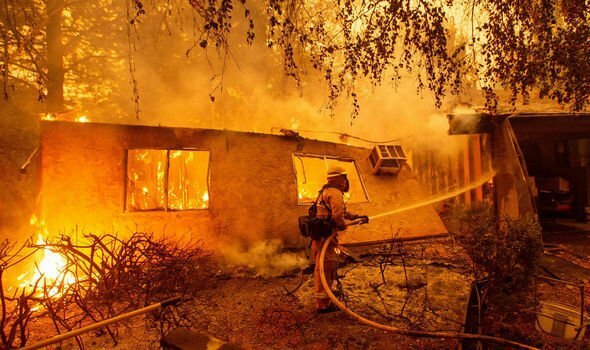 What is so crazy, is that after all of these emails and phone calls about fire danger and warnings from PG&E, they kept the power on even after the fire. 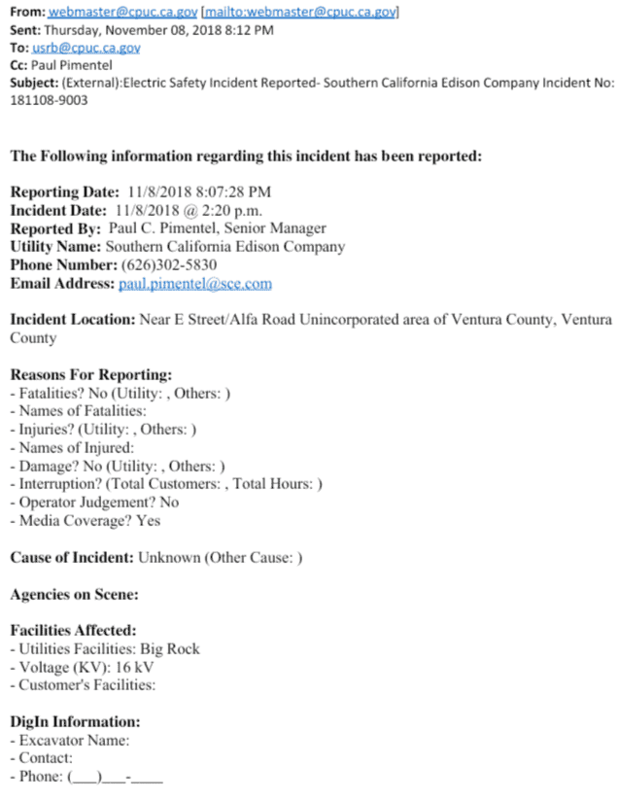 “On Tuesday, Nov. 6, with a forecast of high winds and low humidity expected two days later, PG&E alerted the public that, as a precautionary measure, power might be interrupted in certain Northern California counties, including Butte County. Over the next 48 hours, the utility tweeted out 17 different warnings of an impending Nov. 8 morning shut-off. 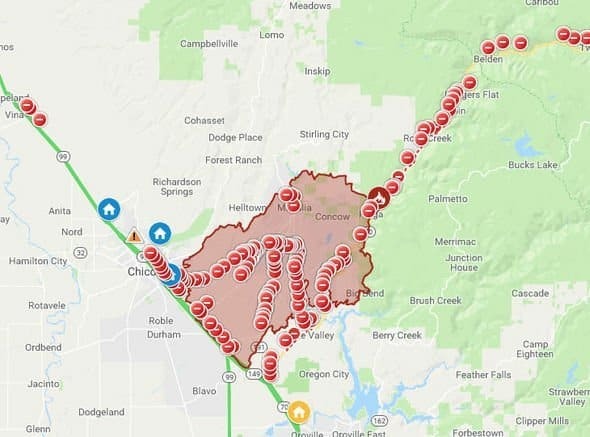 It even tweeted out a warning at 7:56 a.m. Thursday, more than an hour after the Camp Fire was reported, that the power interruption was still an option, before calling it off at 3 p.m. that afternoon, hours after the Camp Fire swept through Paradise. 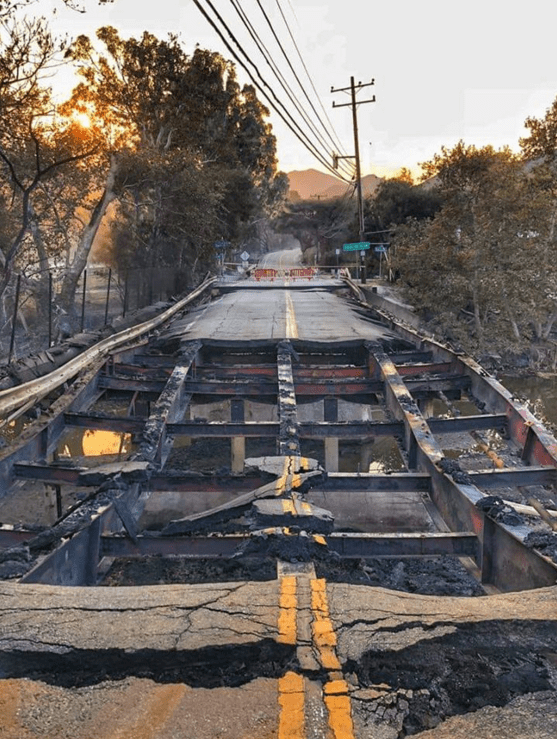 “Paradise Mayor Jody Jones said she received the warning notices from PG&E last week and sensed frustration in her community of the potential inconvenience. So what is really going on here? Warnings of a fire in the future and threats of them during power off, then a fire sweeps through and nothing. They kept the power on after the fire was going through Paradise. Why? Maybe because part of this fire was due to Smart Meters needing to do their job? You would honestly think that PG&E would turn off gas lines to stop from explosions from happening, but they didn’t. It doesn’t stop people thinking that PG&E didn’t conspire and was inviting this fire to burn the town of 26,000 down to ashes. They also mention the winds in this fire and how bad they were blowing. What is strange is that these gusts, according to radar satellites, were coming North headed East. Now if you look at how the smoke expanded then you will see it going West and actually one stream of smoke went South. Why is that? Look at their chart below and it will show you the wind average and gusts. Nothing here is making sense. They warn of fires then don’t shut any electric or gas off. There are also reports that they wouldn’t let residents evacuate. And now the reports of not letting residents back in, but they want their DNA in order to find their family members. Are we living in the twilight zone? They were burning down Paradise for a reason and I’m am almost positive that this is/was a ritual. I’ll explain in a minute why I believe that. The L.A. Time’s even reported about these discrepencies. 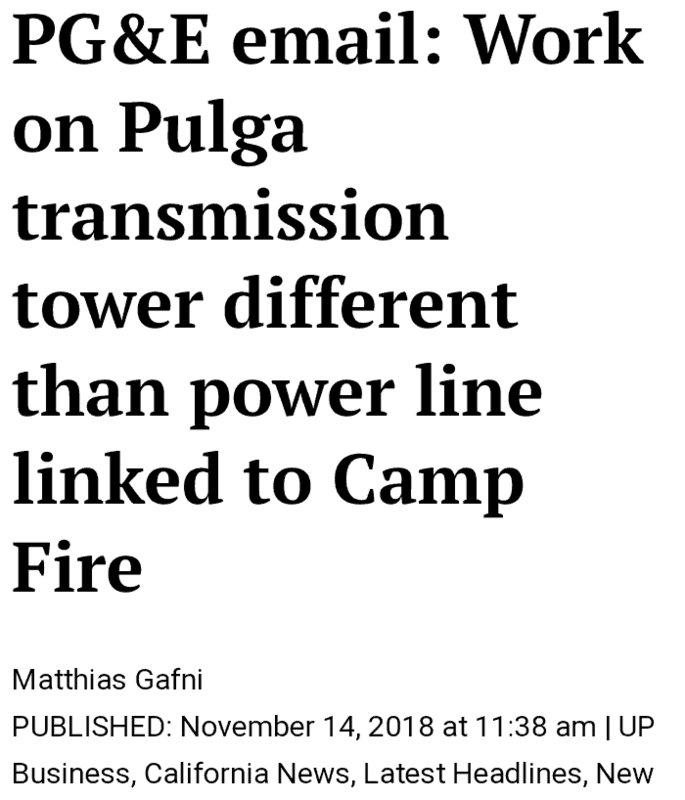 One other thing I want to point out is that PG&E now claims that the lines they were checking on Cowleys land weren’t the lines that caught fire. Are you keeping up with all the lies? You can read it here. PG&E stated in their incident report that there was some issues at the time of the fire and their substations. 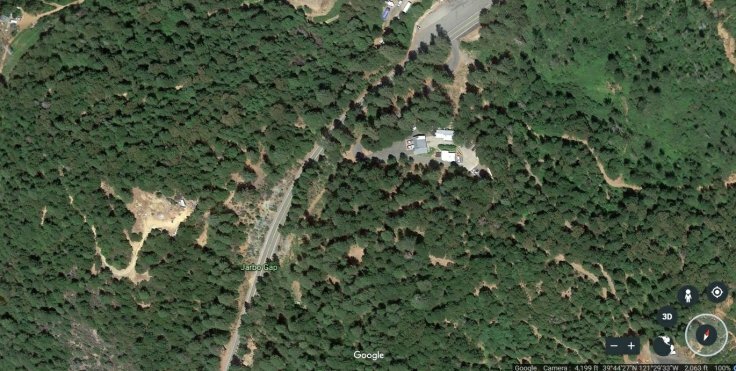 I don’t know if that’s the hydro station above Pulga or the damn itself. My guess it the former. I want you to see these quotes from this article below. So what can I say? They have admitted to a disturbance in the force, I mean circuits and this was minutes from each fire. So we know for a fact that something interfered with the circuitry whether it was from a weapon in the form of a laser set off by man or maybe it is something entirely different behind all of this? Maybe it was AI doing their take over? You think that this AI theory is far fetched? I wrote about it all last year on this blog and it makes more sense than what a lot of people have been saying in regards to AI. Now the talk around the internet is that DEW were without a doubt being used during the fires at Paradise. We saw this with Santa Rosa and the Ventura fire of 2017, the fires in Greece this last year and both recent Woolsey and Paradise fires. 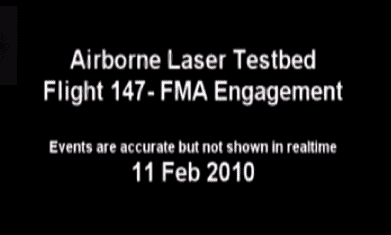 Below is what people claim as proof that these lasers are the reason as to why. 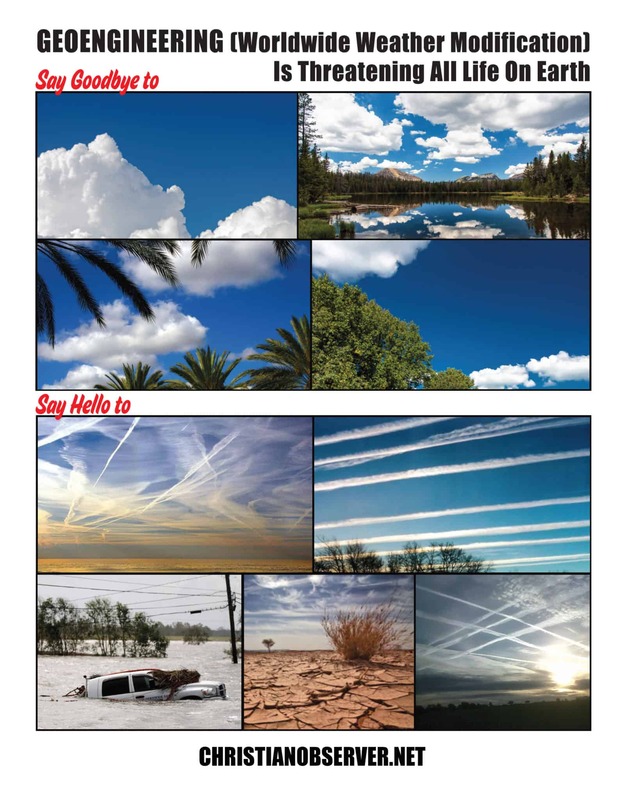 The problem I have with these images is that I personally don’t know where these images came from and in a few cases they may be lens flares or firenados. 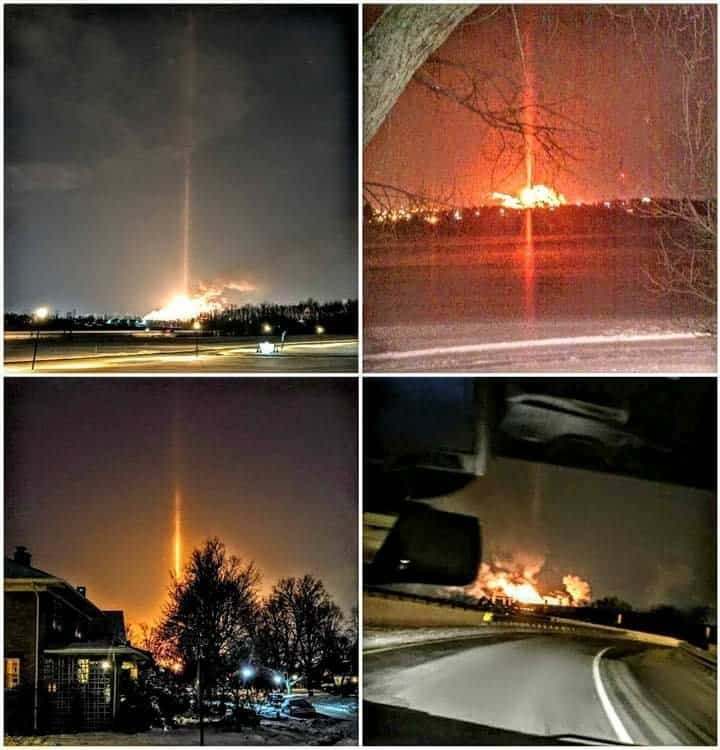 With that said, I do think a few of these images are in fact lasers, but I need to know where and when these images were taken. I would need a source but I’m not denying that they [could be] fake. Are they from any of the fires I mentioned above? Or are they stock military photos? 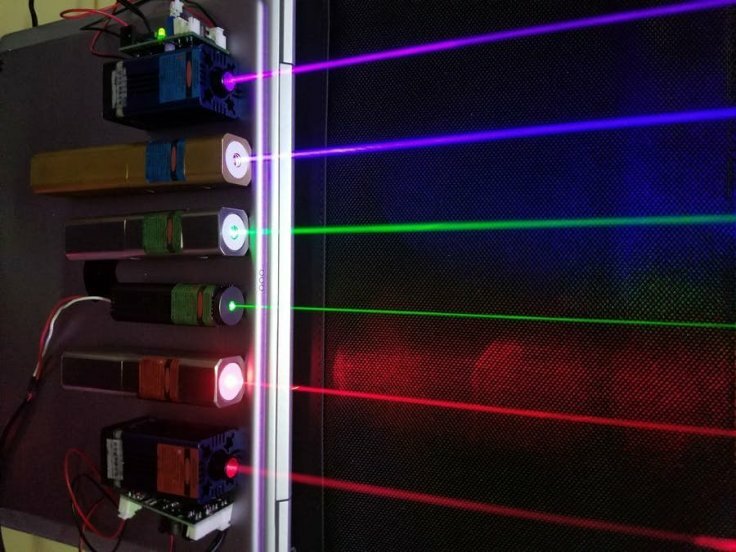 Most people don’t actually realize that some lasers are infrared and can’t be seen. It’s sometimes not as dramatic as something like a Star Wars light saber. 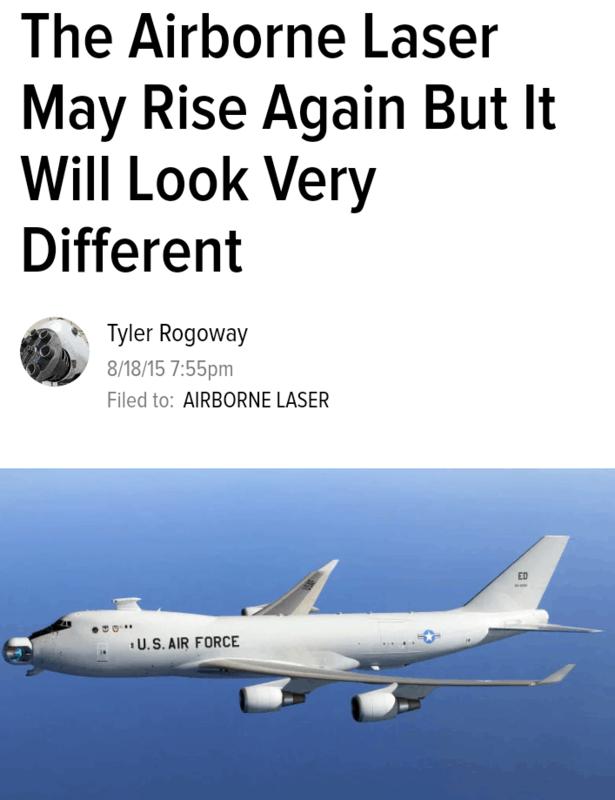 The theory is that these lasers are being “shot” from a Boeing 747 called a YAL-7. 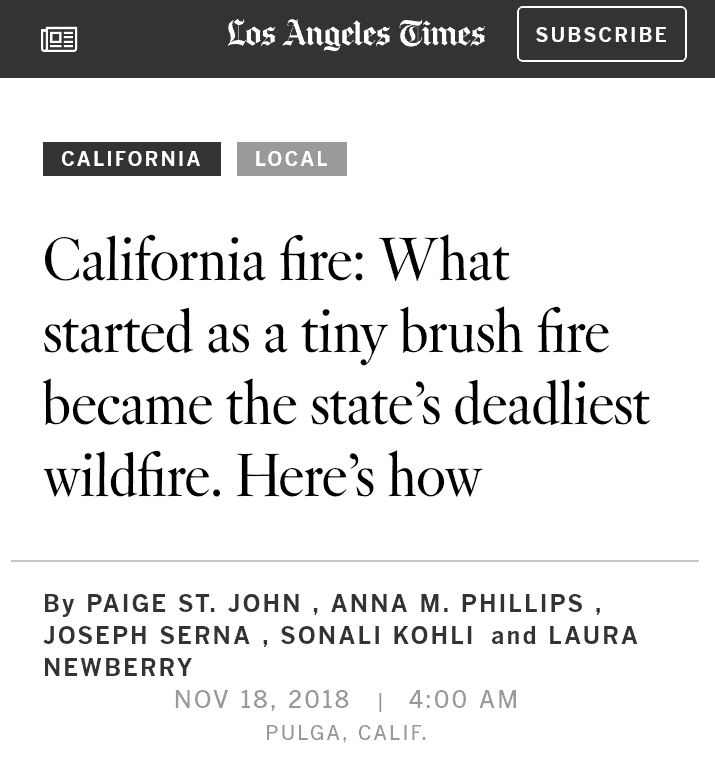 I don’t deny this because I actually wrote about this in dealing with the Santa Rosa fires. 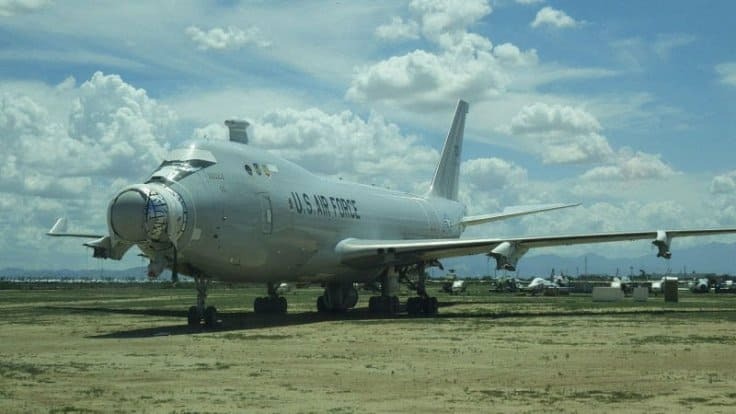 Now you can see that this airliner was in fact dreamed up prior to the Reagan years but there was doubt in it from the very beginning. One of the reasons as to why they claimed they couldn’t use it was because of being behind enemy lines. It was too risky. But, this didn’t stop the Air Force from getting them. So the question is this, were they all grounded at Abe, have they been used yet? Some people would say yes, at these California fires. I can see them using these but they aren’t exactly trying to hide them in plain sight now are they. They even state in the article that they are gong to make something smaller in the future in the size of a drone. 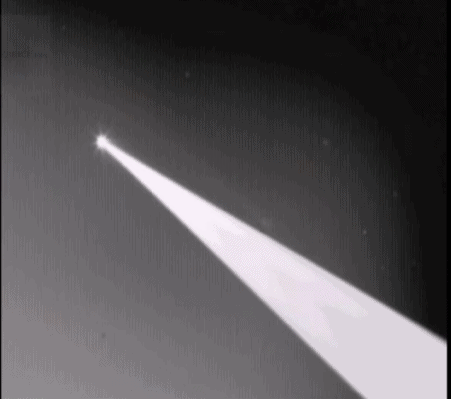 These 747 lasers use the chemical in the plane, so they only use so much at a time. 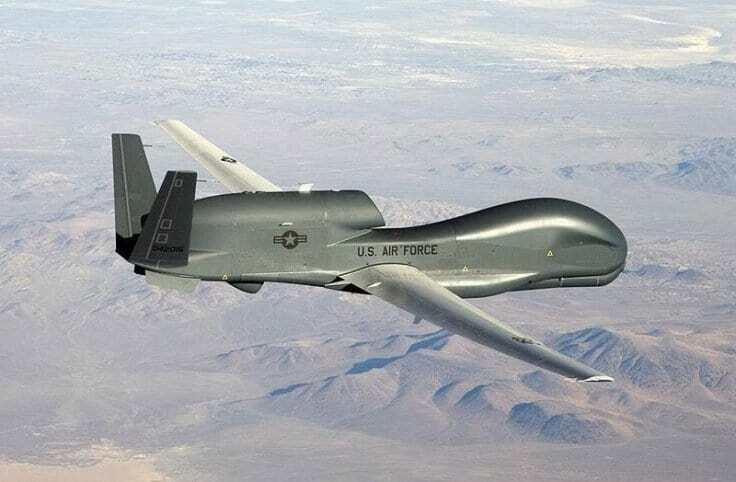 So if I was a betting man, I’d say drone technology would be more realistic. Faster, lighter and cheaper. But notice what they say below. 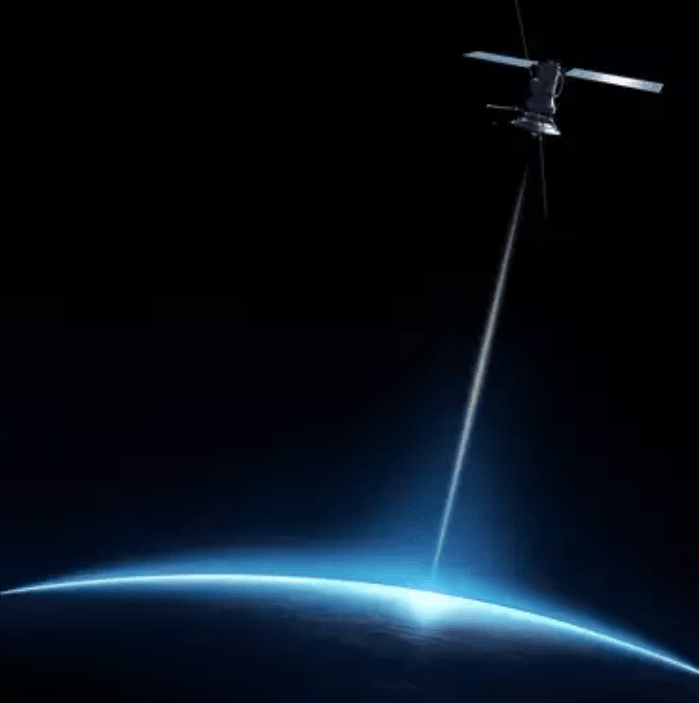 They bring up satellites and lasers, the next frontier. And this is my theory as to how they are shooting lasers at the earth. Once again, I don’t discontinue or deny that they could be using the plane method, common sense just tells me they may not be. 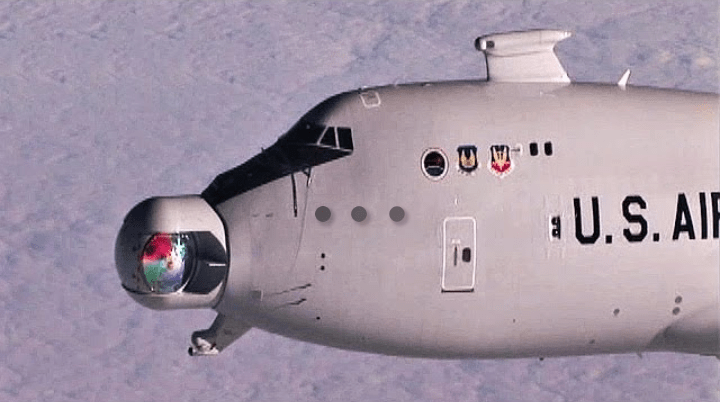 The above video is of the YAL-7. Notice at the beginning it shows it firing the weapon. This is seen from an infrared camera. Once again, from this particular plane the laser cannot be seen. I can’t stress that enough. In the day and age of Photoshop CGI, nothing can be trusted without first hand confirmation and verification. That’s why I question a lot of those images. 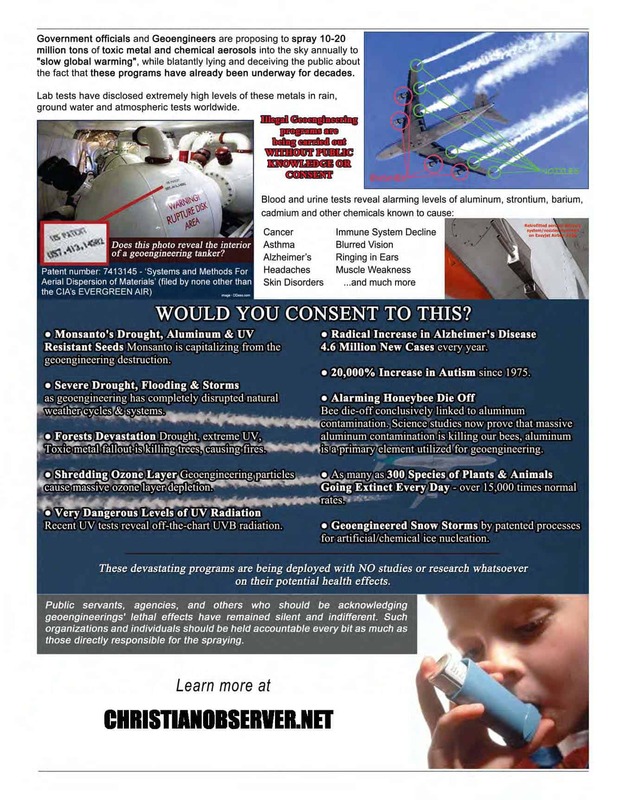 I have already mentioned the use of drones and planes when it comes to DEW lasers. It is very plausible, but in my opinion, unlikely. I’m not saying they didn’t do it that way but I have a gut feeling that Elon Musk’s Falcon rockets that they are launching LEO satellite’s may be a better theory. I honestly think this could be how lasers along with Smart Meters are able to hit sites with pin point accuracy. I mentioned above how these lasers can also only be seen using infrared cameras. I guess if you want to use a giant red or green laser, then the psychological factor is definitely there. But, you would think more people would see giant laser beams hitting houses, buildings and roads as was not the case with Paradise. 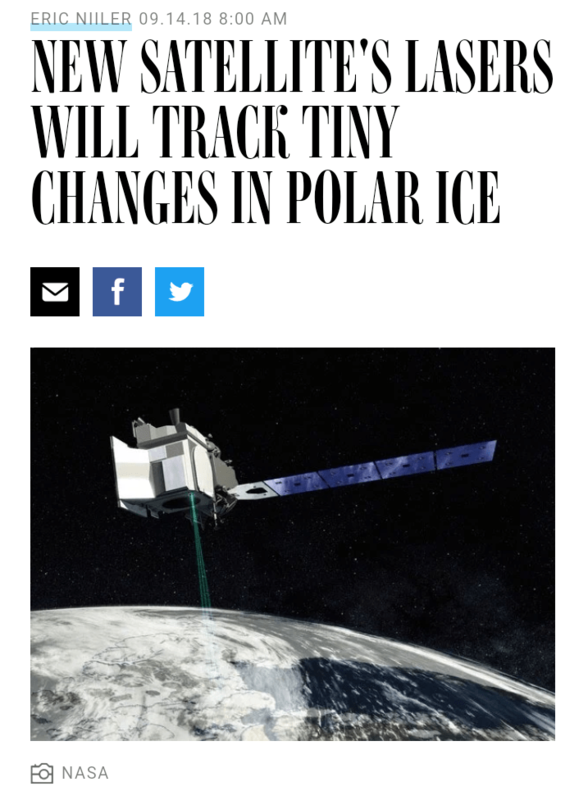 The NASA satellite will scan the Earth’s surface using six green laser beams to measure glaciers and floating sea ice. By taking precise measurements of the ice thickness and mass, NASA scientists will get a handle on the effects of climate change more accurately, researchers say. So did you catch that? 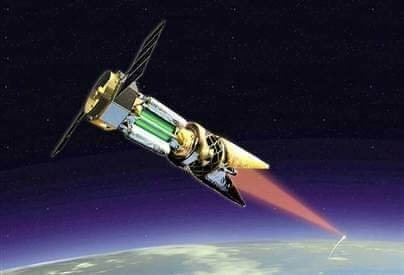 Remember, I’m just referencing this article on a satellite laser so you can get an idea of what a laser can actually do. It can bounce 10k a second to the earths surface and back to the satellite. Do you realize how fast that is? And I bet you can’t see the laser with the naked eye. The 6 lasers cover 3 and a half mile wide areas. 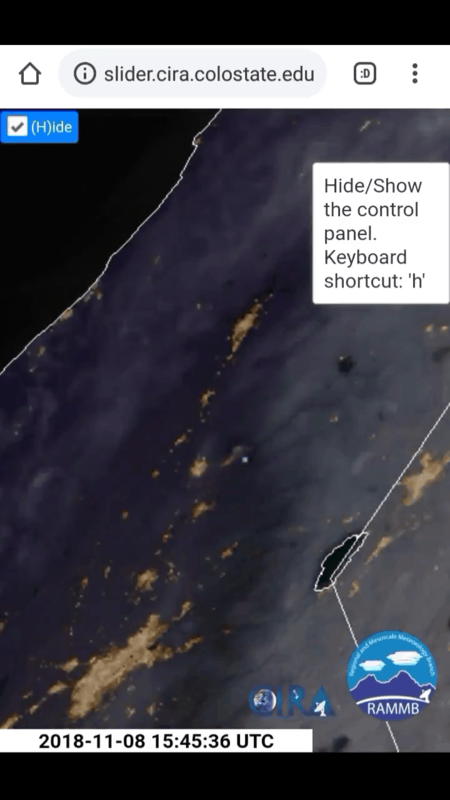 If one of these satellites, hypothetically speaking, carried a DEW, than it would literally take seconds to destroy a town like Paradise that is probably no more than six to seven miles wide. Could you see how a satellite laser is theoretically more plausible than say a YAL-1 747? They are calling it a “Christmas miracle”. 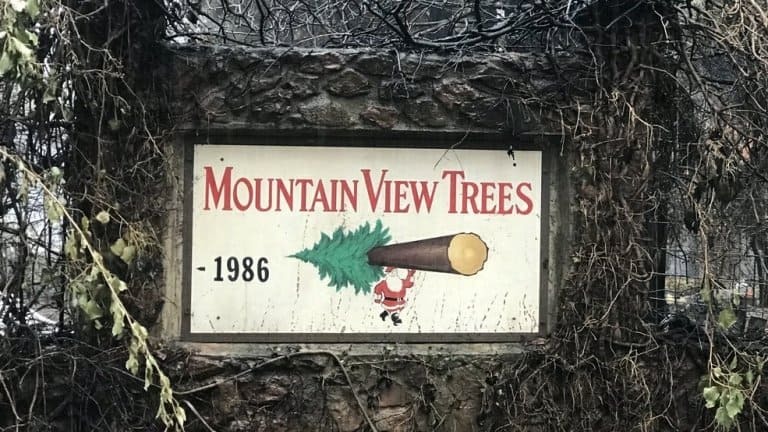 I think its interesting that the Christmas tree lot actually survived. It looks like it didn’t do the DEW. 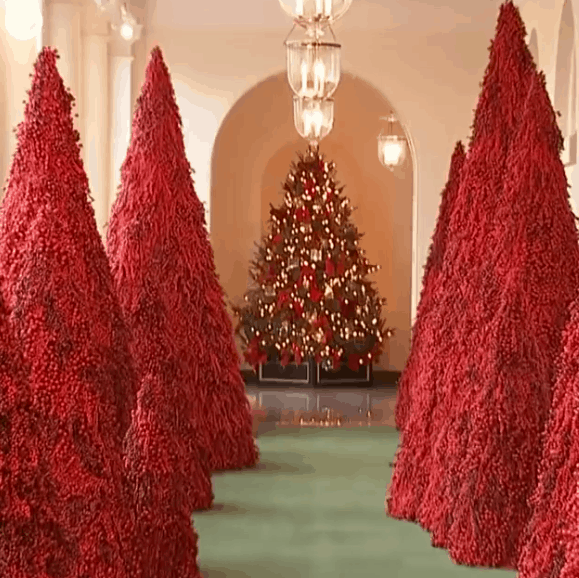 No matter how you look at a Christmas tree, whether you think it represents a phallus or a tree of life or whatever, it is a trip that this is what survived in Paradise. The “tree of life” or “phallus of Osiris” still standing in “Paradise”. You can decide where you’ll go with this story. 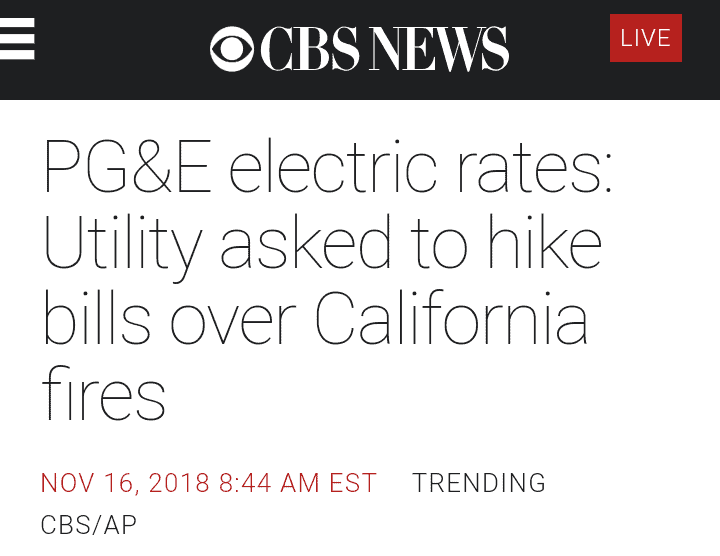 I wonder if it’s a miracle that we as tax payers in California will now have to pay more on our PG&E bills because of this destruction? 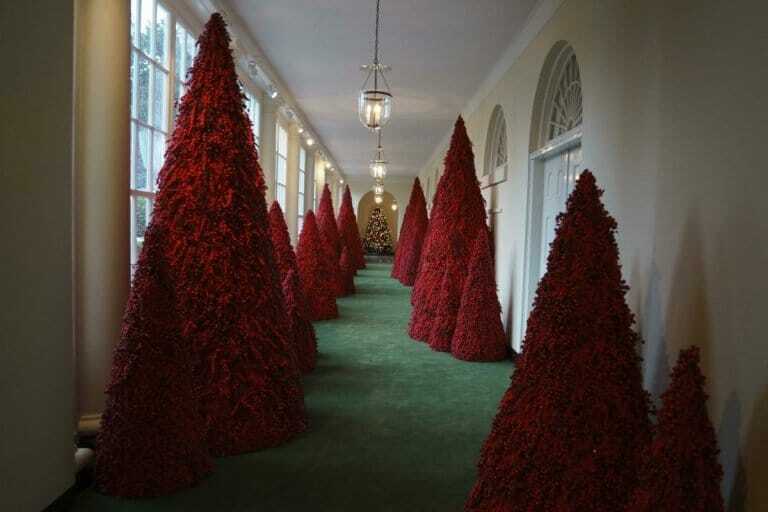 I was thinking it fits their red wave paradigm of “sacrifice”. 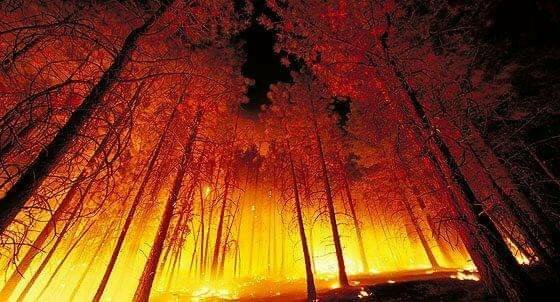 It’s interesting that these trees look like they are on FIRE. These are three images of houses, one by a natural ground fire, one from DEW and the last one from dew and smart meters. And how hot does it need to be to “burn” a bridge?